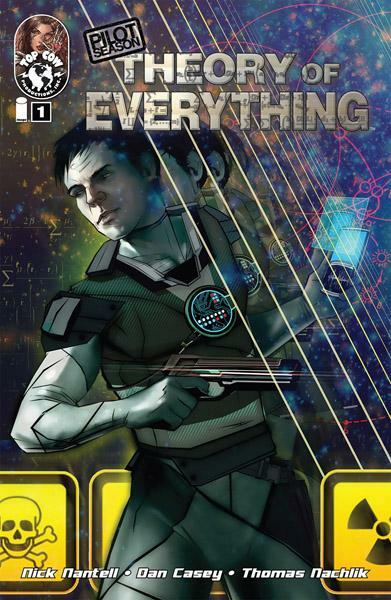 Top Cow’s Pilot Season 2011 contenders have been narrowed down to two comics, The Beauty and Theory of Everything. Out of a starting field of eight, these two have been battling it out to be crowned the winner and have their comic become an on-going series. With that, we have a chance to help Royal Oak native and George A. Dondero High School alumni Dan Casey and his comic Theory of Everything hit comic stores all over the country. PILOT SEASON RETURNS! TAKE CONTROL! Charles Witten is a brilliant scientist capable of inventing devices that will change our world. Unfortunately, most of the scientific community thinks he’s a crackpot. As does the government, until? a precision team of heist men rob a bank in Switzerland using what appears to be Witten’s dimension hopping technology. Technology that Witten designed, but never completed? Writer/director DAN CASEY and artist THOMAS NACHLIK (LAST MORTAL) deliver fast-paced, action-packed science fiction that will keep you guessing. Casey, attended the College for Creative Studies and completed his Masters in Film Directing at the American Film Institute. He currently resides in Los Angeles California and was recently tapped to write an untitled sci-fi crime thriller project being directed by Bobby Glickert. What inspired you to write Theory of Everything? I’d have to say the inspiration came from a guy named Nick Nantell, who I worked with on the comic. Nick and I are credited as co-creators, but it was really Nick’s wanting to tell a story in a world that dealt with quantum physics and multiple realities that was a key motivator. Nick had all these great ideas when he came to the table and those were the starting point for the comic. From there, we hammered out the core points of the story, created the characters, and I jumped into writing the script itself. You’ve written screenplays, how was writing a comic different? It was weird! It was both similar to screenwriting and very different. The good news, I think- is that all storytelling fundamentally comes from the same place. Whether it’s around a campfire or you’re in a theater, we’re still kind of talking about the same instinct, so I’d have to say the biggest difference was the immediacy of comic book writing. The script for your average movie is between 100 and 120 pages, while your average comic is way, way shorter. It makes writing for comics a very direct, very upfront and honest process. I liked it a lot. What comic books inspired you as a kid? What was your first comic book? How did the team behind Theory of Everything come together? Well, we were really lucky to be able to do this with the guys over at Top Cow (who published the comic). They were the ones who really brought the team together. Once I’d written a draft of the script, we were lucky enough to get in with Thomas Nachlik. Thomas is this incredible artist, and what he did in actually bringing the comic to life was amazing to watch- especially from the perspective of a first-timer. John Rauch was brought in once Thomas was finished- John did all this amazing color work, and lastly the cover image was by Erik Jones. It was an incredible team, all of whom were Top Cow vets. I was very fortunate to get to work with them. You can still help Casey and the crew behind Theory of Everything be crowned the winners of the final round of Pilot Season 2011 by voting for them here. Votes can be cast once a day until voting ends until Saturday, January 14th at 11:59pm PST and a winner will be announced the following week. This entry was posted in Detroit, Things To Do and tagged Comics, Dan Casey, Michigan, Pilot Season 2011, Royal Oak, Top Cow. Bookmark the permalink.